Glycogen is the major storage carbohydrate in animals, corresponding to starch in plants; it is a branched polymer of α-D-glucose. It is stored mainly in liver and muscle. Due to more muscle mass, the quantity of glycogen in muscle (250gm) is about 3 times higher than that in the liver (75 gm). Liver glycogen helps to maintain blood glucose level: Liver glycogen functions to store and export glucose to maintain blood glucose level between meals. After 12-18 hrs of fasting, liver glycogen is almost totally depleted. Muscle glycogen serves as a fuel reserve for the supply of ATP during muscle contraction. 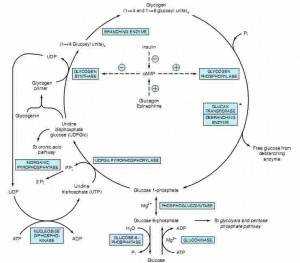 Although muscle glycogen doesn’t yield free glucose (as muscle lacks Glucose-6-phosphatase), pyruvate formed by glycolysis in muscle can undergo transamination to alanine, which is exported from muscle and used for gluconeogenesis in liver. a. Glycogenesis: The synthesis of glycogen from glucose occuring in the cytosol in the presence of ATP, UTP and glucose is called glycogenesis. Glucose is converted into glucose-6-phosphate by the action of glucokinase or hexokinase. 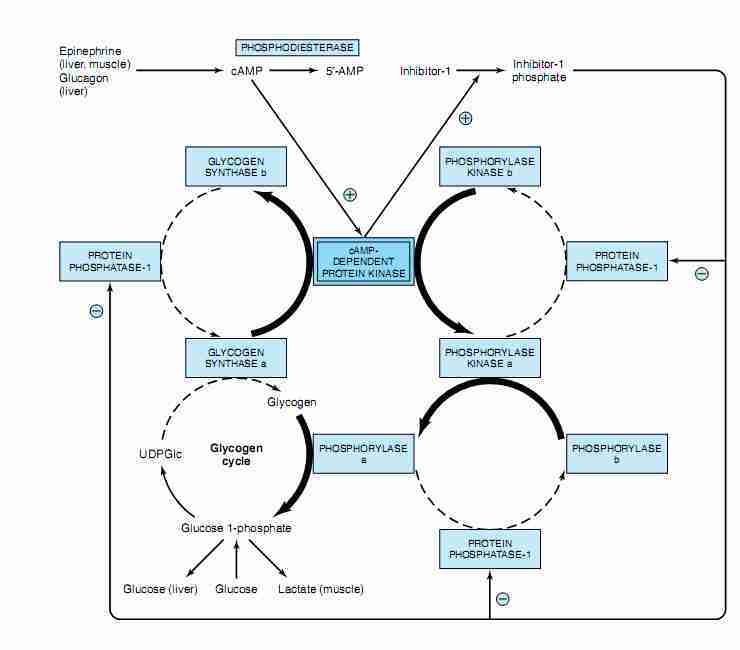 Glucose-6-phosphate is converted into glucose-1-phosphate by the action of Phosphoglucomutase, passing through an obligatory intermediate step of glucose-1,6-bisphosphate. Glucose-1-phosphate is converted into UDP-glucose by the action of Uridyl Transferase (also called UDP-glucose pyrophosphorylase) and pyrophosphate is formed, which is hydrolyzed by pyrophosphatase into 2 molecules of Pi. Glucose molecules are assembled in a chain by glycogen synthase, which must act on a pre-existing glycogen primer or glycogenin (small protein that forms the primer). 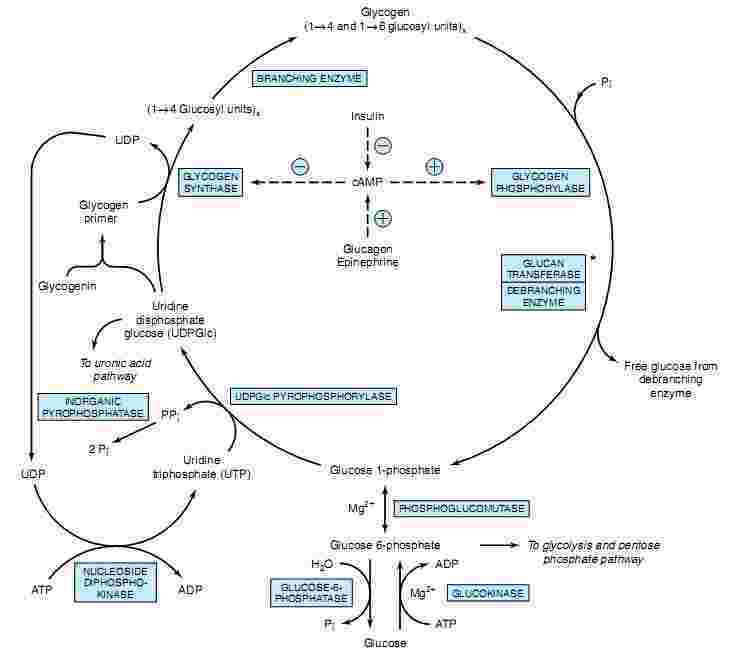 The mechanism for joining glucose units is that glycogen synthase binds to UDPG, causing it to break down into an oxonium ion, also formed in glycogenolysis. This oxonium ion can readily add to the 4-hydroxyl group of a glucosyl residue on the 4 end of the glycogen chain. Branches are made by branching enzyme (also known as amylo-α(1:4)->α(1:6)transglycosylase), which transfers the end of the chain onto an earlier part via α-1:6 glucosidic bond, forming branches, which further grow by addition of more α-1:4 glucosidic units. 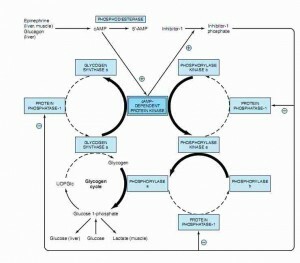 b. Glycogenolysis: The degradation of stored glycogen in liver and muscle constitutes glyogenolysis. It is not the reverse of glycogenesis but is a separate pathway. Here, glycogen phosphorylase cleaves the bond at the 1 position by substitution of a phosphoryl group. It breaks down glucose polymer at α-1-4 linkages until 4 linked glucoses are left on the branch. Glycogen phosphorylase can be used as a marker enzyme to determine glycogen breakdown. 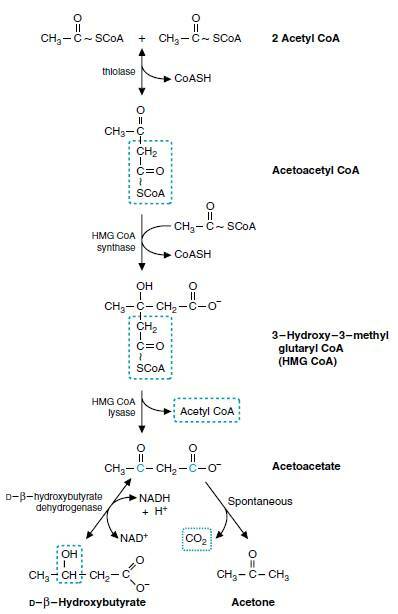 The 2nd step involves the debranching enzyme that moves three remaining glucose units to another 1,4 end of glycogen. The final action of the debranching enzyme is the hydrolysis of the glucose attached as a 1,6-branched mono residue, giving one free glucose molecule. This is the only case in which a glycogen metabolite is not glucose-1-phosphate. 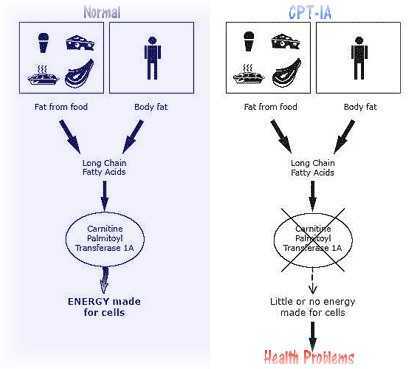 The 3rd and last stage converts G1P (glucose-1-phosphate) to G6P (glucose-6-phosphate) through the enzyme phosphoglucomutase. 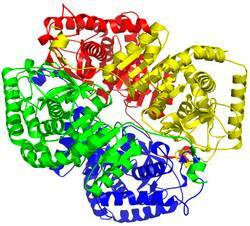 Acid maltase or alpha-1,4 glucosidase is a lysosomal enzyme that continuously degrades a small quantity of glycogen. Deficiecy results in glycogen accumulation causing Pompe’s disease. The control is carried out in such a way that glycogen synthesis is increased when substrate and energy levels are high. On the other hand, glycogen breakdown is enhanced when glucose concentration and energy levels are low. The hormones, through a complex series of reactions bring, about covalent modification : phosphorylation and dephosphorylation of enzyme proteins. cAMP acts as a second messenger for hormones. Calcium binds to calmodulin (calcium modulating protein) and directly activates phosphorylase kinase without the involvement of cAPM-dependent protein kinase. Muscle phosphorylase kinase activates glycogen phosphorylase. The metabolic defect concerned with the glycogen synthesis and degradation are collectively referred to as glycogen storage diseases. Glycogen storage diseases are inherited. Features: Glycogen accumulation in lysosomes; juvenile onset variant: muscle hypotonia, death from heart failure by age 2; adult onset variant: muscle dystrophy; enlarged liver and nervous system is also affected. Features: Accumulation of branched chain glycogen; liver enlarged; hypoglycemia; muscle weakness. Features: Hepatosplenomegaly; liver cirrhosis; accumulation of glycogen with few branches; death from heart or liver failure by age 5. Features: Muscle glycogen stores very high; poor exercise tolerance; muscle cramps; blood lactate and pyruvate very low after exercise. Features: Hepatomegaly; accumulation of glycogen in liver; mild hypoglycemia; ketosis. 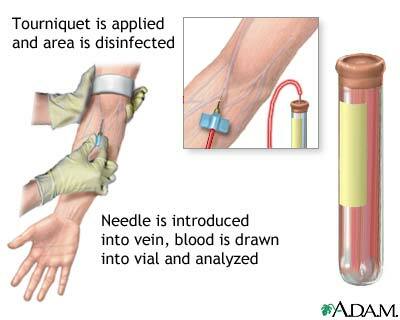 Features: Muscle cramps due to exercise; blood lactate not elevated; hemolytic anemia; poor exercise tolerance. It is more like a lecture notes for quick reciew of the topic. Nice class note. I could print it for my reading. This brings back memories (or nightmares) of Chemistry 1 & 2 in college. Thanks for the correction Ronald.